Facebook has just released its official iPad app. The tablet device was unveiled in January 2010, but development and negotiations with Apple stalled the release of Facebook’s app until now. 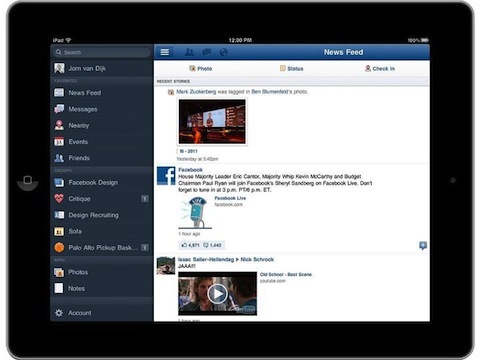 Facebook for iPad is now available in App Store. Bigger, better photos: Photos appear bigger and in high-resolution with easy to flip and rotate features in the photo album function. Videos can also be viewed in full screen mode. Fast navigation: Just tap, slide or pinch to travel back and forth between one screen and another in no time. Play games on the go: Play your favorite Facebook games wherever you are, and on a bigger screen. Less is more: With fewer features on the screen at a time, the new Facebook allows you to zoom in and out of photos, updates and stories more smoothly. Never lose your place: Use simplified navigation to send a message, see your notifications or browse your bookmarks without switching screens. Tap to send messages: A simple dropdown menu makes it easy to scan and send messages without visiting your inbox. See who's nearby: Check out the Nearby map to see what your friends are up to. According to a report from the New York Times, Facebook on the iPad will also make use of the device’s multitouch capabilities, a feature that hasn’t been available thus far in its iPhone offering or mobile web page. The app will also support games and Facebook chat, as well as the ability to capture photos and videos with the iPad and post them directly to Facebook. The new Facebook app is touch optimized giving you easy access to popular Facebook features and services like Facebook Games, Messages, Feeds, Chat, Photos and Videos. You can also swipe the screen to display the hidden sidebars on the left or right side of the screen. Apart for the smooth photo viewer and the fact that it now fits properly on the screen, key features seem to be the prominence given in the platform to a better games and apps "experience". This is all part of Facebook's new commitment to third-party developers, as alluded to by Zuck at the f8 conference. According to TheRegister , Bugs seem to include a dock compatibility issue, where the send button disappears when iPads are docked, and some users reported that the left-hand button bar didn't respond to taps properly. A new version of the app for iPhone has also been released and the mobile web version has been overhauled as well, according to Facebook's wonks. If you’re reading this on your iPad, you can access the Facebook app here.